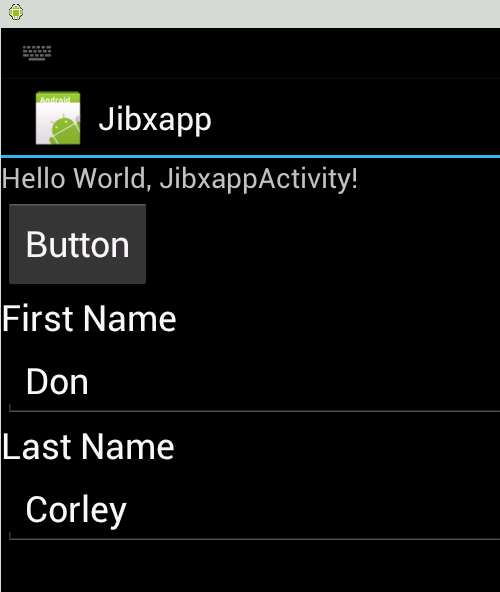 JiBX is an excellent tool for binding XML data to Java objects on the Android platform. - It's easy to use! Let's create a sample project. First, create java bindings for your XML schema using JiBX, or select a pre-build schema library. For this example, we'll use a pre-built binding from the JiBX schema library. 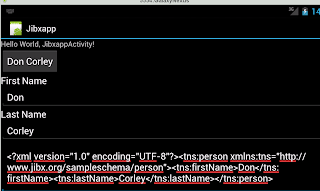 Our sample xsd file is an XML definition which includes a person's first and last name. Click here to see our sample schema in the JiBX library. You may want to take a look at the schema and the JiBX generated java source code. link and select 'save as'. Next, download the jibx runtime jar file by right-clicking this link and select 'save as'. We'll need these jars shortly. Now we're ready to create our Android application. First you need to install eclipse and the Android SDK. From Eclipse, select New -> Project -> Android Project. I'm calling this project 'jibxapp'. On the next screen, select your target api. Finally, enter your java package name. You project should appear in your workspace. Navigate to jibxapp -> res -> layout and double-click main.xml to bring up the form editor. You may want to test your Android emulator here by right clicking the project name and selecting 'Debug as' -> 'Android Application'. To add your java binding and the JiBX runtime, right-click your project name and select properties. Click 'java build path' -> Libraries -> 'Add external jars' and add the two jars that we downloaded earlier. 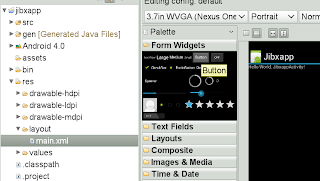 Navigate and open your Android source code file. * Add the test table records. * Marshal this message to xml . * Unmarshal this xml Message to an object. This program takes the First and Last Name entered, plugs them into a java data object, marshals the object to xml, and unmarshals the xml back to a data object and extracts the data from it. I made this program very simple, of course you would not do this kind of processing in the main thread. 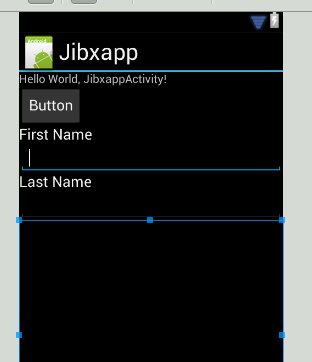 Run your application by right clicking the project name and selecting 'Debug as' -> 'Android Application'. Enter your first and last name and click the button on the top. In Android Development,it doesn't perform bytecodes. Android's java runtime uses a register based virtual machine that completes .dex information instead of class information. Theoretically you could generate those instead of java bytecode. First, I think the author did a great job to make JiBX work on Android, however, JiBX was originally designed for desktop and server side development, hence it's too heavy-weight for resource limited mobile device like Android. I would recommend a light-weight xml binding framework tailed for Android platfrom, the library is called Nano, the jar is less than 70K, performance comparable to Android native parser like SAX and Xml Pull, it supports both XML and Json binding, it uses annotation driven binding, similar to JAXB, also it provides a binding compiler to auto-generate bindable class from xml schema, you may have a try if you are interested in it. Actually JiBX was designed to be small and fast. 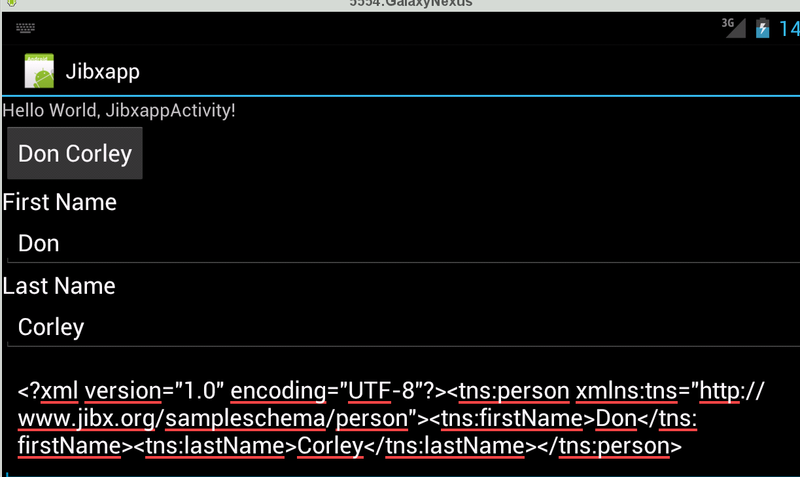 It uses the xmlpull parser which is built into Android. It is perfect for the Android platform. After failing with some Java XML projects, JiBX did the work. Hi I am Emi from Chennai. Thanks for sharing the informative post about Java technology. It’s really useful for me to know more about this technology. Recently I did Java Training in Chennai at a leading Java Training Institutes in Chennai. That’s a great article. But there is more to do if you learn Android. Just try visiting our page! That is a brilliant article on dot net training in Chennai that I was searching for. Helps us a lot in referring at our dot net training institute in Chennai. Thanks a lot. Keep writing more on dot net course in Chennai, would love to follow your posts and refer to others in dot net training institutes in Chennai. Excellent post.You gave a detailed explanation. You're the best particularly for the high caliber and results-situated help. I won't reconsider to embrace your blog entry to anyone who needs also, needs bolster about this zone. How can I doto use my own java class instead the options provided by jibx? I reading your post from the beginning, it was so interesting to read & I feel thanks to you for posting such a good blog, keep updates regularly..
You're really great especially for the high gauge and results-arranged help. I won't reevaluate to grasp your blog passage to any individual who needs additionally, needs support about this zone.